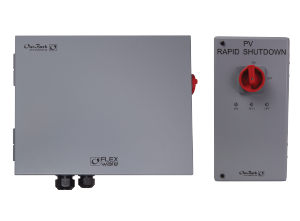 OutBack provides a fully-compliant PV rapid shutdown equipment plus combiner solution with the RSD-AFCI. The RSD-AFCI is rated to 600VDC for integration in a wide range of systems and designed for ease of service and clean wire management. This packaged system includes one combiner box for one FLEXmax 100 charge controller. Simply order one extra combiner box for each additional charge controller, no additional rapid shutdown or AFCI equipment required.